April 20, 2019 | Big Little Lies is Coming Back! April 20, 2019 | Should you pick up an antenna you find by the side of the road? Can you use a Televes antenna without its reflectors? Televes antennas use large reflectors, which you can see at the left side of the image. They’re the tall, diagonal panels to the left of the orange assembly. 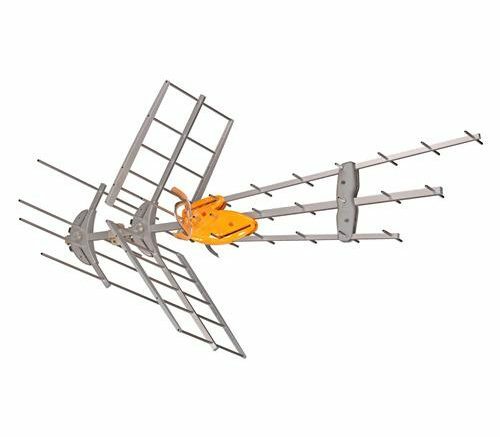 They help the antenna receive signals more efficiently and block signals from opposite directions. But what if you don’t want them? The reflectors have been damaged in a storm. I don’t know, maybe a well-placed tree branch took them out and miraculously avoided the rest of the antenna. The reflectors are too big. Maybe you need to mount the antenna in a fairly small space, or mount it very close to a roof line. You actually want to get signals from two completely different directions. One thing the reflectors so is isolate signals that are coming from the back side of the antenna. If you are trying to watch TV from two stations that are 180 degrees away from each other. This antenna will actually do a fair job of that if you take the reflectors off. So, what does happen with the reflectors off? Turns out, the antenna does a fairly good job of compensating. The amplifier is one of the smartest ones out there and it’s often capable of boosting the lower signals you’ll get without the reflector. You may get a little more noise, however, so it’s best to leave the reflectors on unless you have a specific need. Does live TV even matter anymore? IS IT TRUE? Antennas haven’t changed that much in 50 years? Big Little Lies is Coming Back! Should you pick up an antenna you find by the side of the road?